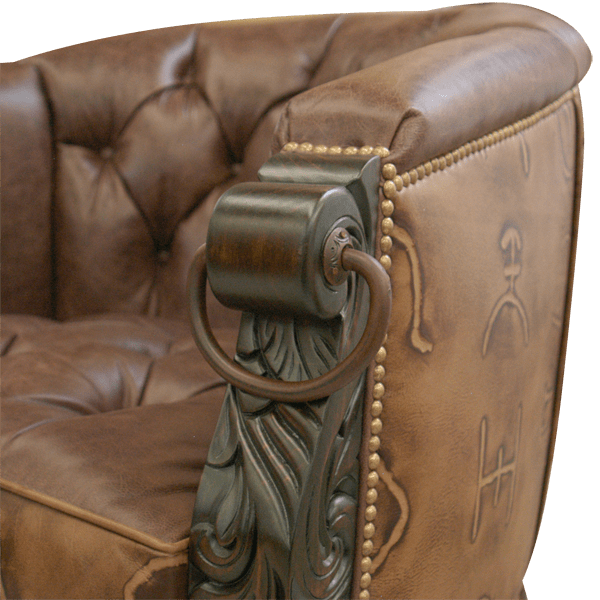 The leather upholstery on our custom furniture is an example of our dedication to quality craftsmanship. All of handcrafted furniture is upholstered with fine fabric or full grain leather. Full grain leather is the finest leather available. All of our upholstery is double stitched for extra strength and durability, and it is precision hand tacked to the entire wood frame by our skilled craftsmen. The button tufted seat cushion and the inside seat back of this handcrafted chair are upholstered in brown full grain leather. The front side of the seat cushion is decorated with ranch brand designs. 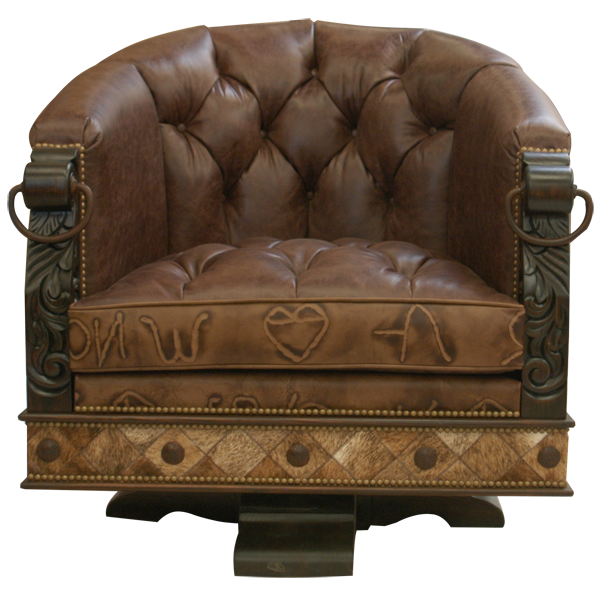 The reverse seat back and the sides of the chair are upholstered in full grain leather with ranch brand designs. 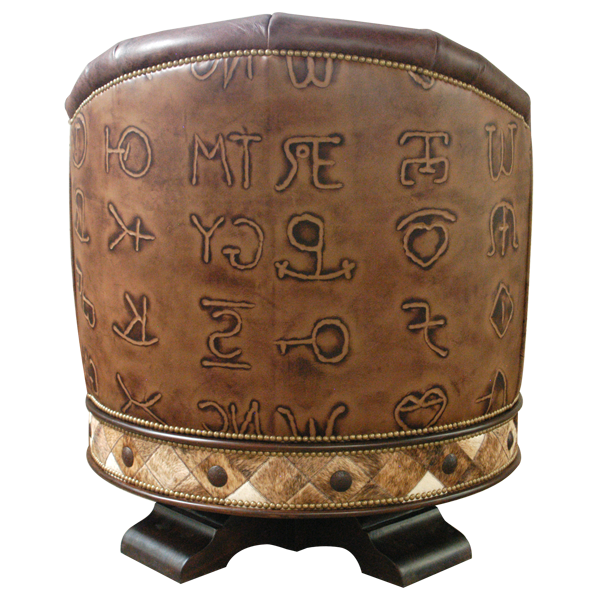 The armrest of this handcrafted chair are hand carved with scroll designs and each armrest is decorated with a hand forged iron ring. Additionally, the armrest are accompanied with solid wood, vertical, hand carved scroll and floral designed uprights. 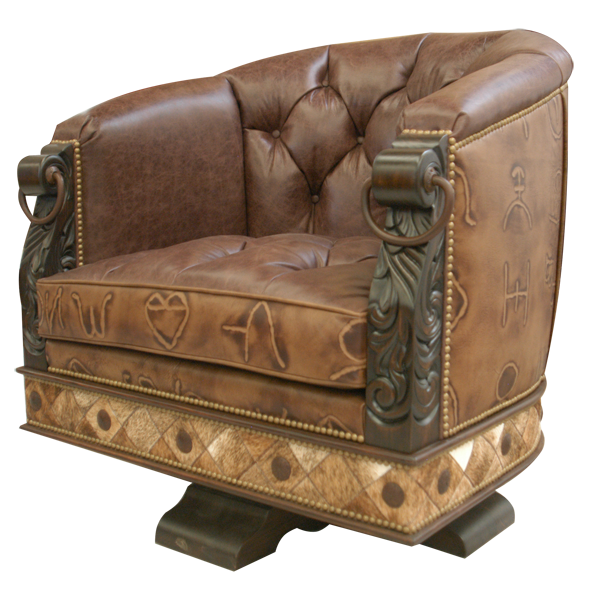 The beautifully finished lower wood base is upholstered with rich, brown full grain leather with ranch branch designs. Also, the lower wood base is decorated with hand forged iron conchos. The entire chair rest on a durable quadripartite revolving support. It is guaranteed for life and is 100% customizable.